DNS Speed and reliability are fundamental to the performance of your website and essential to the growth of your business. In order to overcome outages and ensure digital success it’s important to evaluate your DNS infrastructure and determine which configuration is best for your IT environment at this layer. 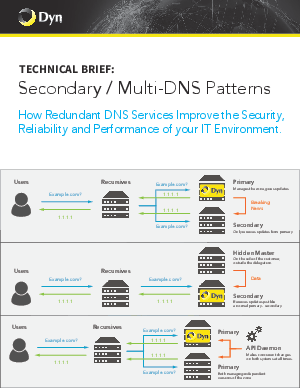 Discover how you can use Secondary or Multi-DNS architecture to promote business continuity, and optimal DNS resolution performance.